An extra GC Improvers Course is running on 5th May and can be entered now. The course propectus for the 2014 season is here and entries can now be made here.  From October to next March, The Croquet Academy are offering one to one and small group coaching.  Suitable for GC and AC players of all levels seeking to improve their game.  Cost for non SCCC members -­‐ £20 per session including tea or coffee and biscuits.  Session timings will be agreed individually between the coach and the player.  The Academy administrator will identify a suitable coach to meet your needs and arrange for the coach to contact you. This coaching season is over. Thanks to all who came on courses and helped the Academy. Once the new programme for 2014 is finalised it will be posted here and a newsletter sent to all registered addresses. "Delighted to be able to tell you that I won the Latham Cup at Bristol this weekend, winning 5 matches and with 11 bisques in the final full game, beat Bob Scott who plays off 6. Almost all the games I held on to the last bisque and used it to peg out. 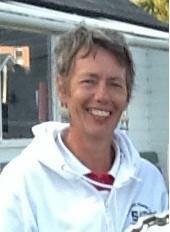 Caroline Denny who attended the Development Course in Handicap Play on 12th -14th April this year and previous year's course has won the High Bisque Tournament at Budleigh Salterton this last weekend. The on-line entry channel for the 2013 season of courses is now open on this website. Check here.